When I was browsing Internet radio Jango, where my current pop single has received over 2,000 airplays, I stumbled upon an 80s pop star Stephanie Mills. Stephanie, a childhood friend of Michael Jackson, has an amazing voice. I haven't seen nor heard this woman since the 80s. So when I listened to her new single "yesterday" (on Jango), a remake of The Beatles smash hit, I was gobsmacked (and quickly bought the track off Amazon MP3)! It kinda reminds me of the origins of my new single -- Stephanie Mills rendition of "Yesterday" is simply guitar and voice. I love it! 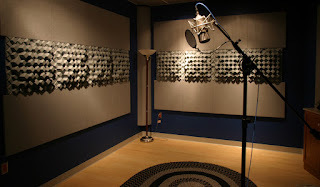 SINGING TIPS: As you practice, please pay attention to the way she projects her voice; and the way she switches octaves. Make sure your breath intake is done wherever there is a break to do so. Steadily drop the jaw and drink that breath before each note. Please pickup the lyrics here and Google for MP3 download. Barbra Streisand's "The Way We Were" topped the Billboard Hot 100 chart for one week in 1974, back in the day when they made extraordinary music. Like it or not, this is an amazing song to train your vocals with. So much so that I now use this song to coach some of my students. Please have a listen to the marvelous Barbra Streisand in one of her best live performances of her career. See the way she expresses herself in demeanor -- and voice. You may download lyrics to this song from Seek Lyrics and Google for MP3 downloads of the song. Tomorrow, January 6th, I debut at the Colosseum Gym in Oysterbay as dance-for-fitness instructor and choreographer. I am SO excited. Rozalla, thanks for the autographed Best Of album you sent me in the post all the way from London. You are the best my dearest friend. You know I will always love you. Guys, I will kickoff tomorrow's hectic fat burning DANCERCISE with sensational dance remixes from my friend Rozalla, Zambian born British Queen Of Rave, from her Best Of album. Rozalla toured with Michael Jackson on his "Dangerous" tour, opening all of his performances. I'll be spinning the remixes of her hit singles Baby, This Time I've Found Love; followed by the remix of new pop single "I Could Never Live (Without Your Love)" from Joett; and then on to smash hits from Kylie Minogue, Janet Jackson, Ultra Nate, Cher and much much more. We're sure as hell going to be burning up the dance floor you guys...and getting in shape while we're at it! Isn't that like SO awesome? Imagine all the extra pounds gained from the holiday season melting away like magic...in my fast-paced dance class? So cool! Come join the most fun way to get in shape, look good and feel great. It's all happening at Dar's premier gym -- the Colosseum. 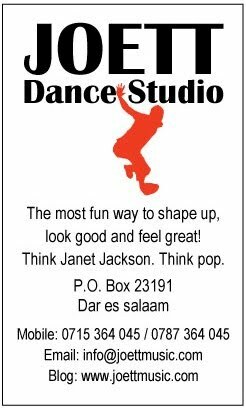 Dance Schedule: Thursdays 9am, Saturdays 9am. Open to Non Members ONLY for the DANCE classes. Fees: Non members TShs10,000 / members TShs5,000. Hi everyone -- and a Happy New Year! What a way to start the new year...with a bang! I've moved my dance-for-exercise program to the Colosseum Gym in Oysterbay, starting this Thursday January 6th and Saturday January 8th, it all happens in their massive aerobics room upstairs. More space, more fun. To begin with, we're running twice a week (Thursdays 9am and Saturdays 9am); and hopefully add more slots over time. It has been a hectic couple of weeks; I gave a jazz concert for a private 60th birthday party at a boutique hotel in Masaki December 28th; and there's a substantial amount of work I put in with the promo of my new single I Could Never Live (Without Your Love). I have been pretty busy. I signed a PR deal with a firm in the US the other day...and the song goes on. Enough about me. Hope to catch up with you guys (dancers) at the Colosseum Thursday and Saturday.